The Most Popular Aftermarket Loop Style Race Kart Bumpers in the USA ! Bergfelt Racing Enterprises is pleased to offer our Custom Bumpers for kart racers. We have been supplying bumpers since 2001. 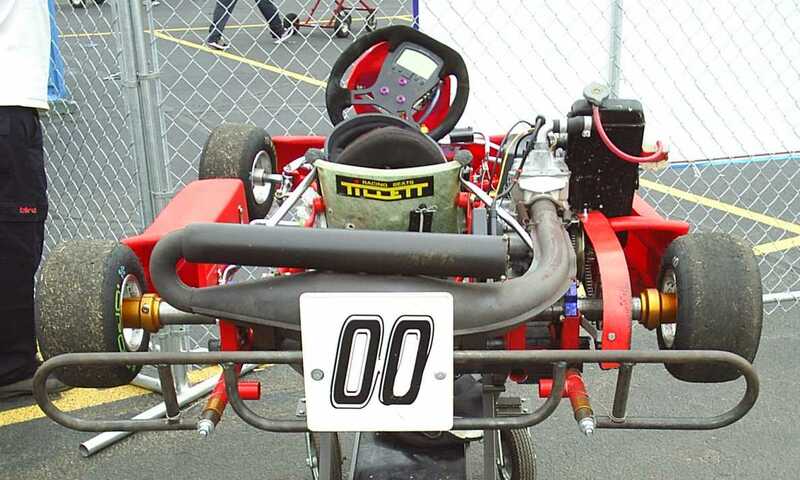 Most of the bumpers pictured on this page are the loop style that are meant to minimize the chance of other karts climbing over in the event of contact with the rear tires. We can also fabricate more conventional bumpers. Bergfelt's Bumpers are made from quality 3/4" od, mild steel tubing and are MIG welded. We use mild steel because the bumper should bend in a hard collision. As the bumper bends, it absorbs the shock protecting the driver and the chassis. The bumpers are supplied unfinished, ie. they are not chrome plated or painted. We leave that up to the customer. Our original prototype bumper made for a CRG oval kart. The karts above were spotted at the 2005 R-Max Nationals. 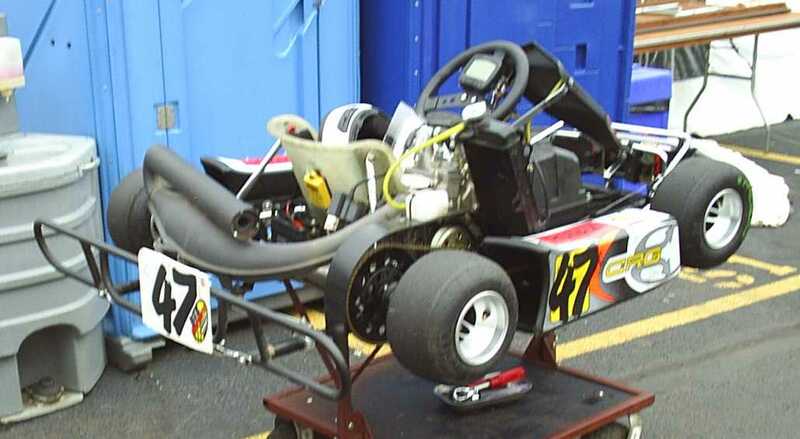 These karts were competing in the JR Max division that requires an extended bumper. Our bumpers fit the bill perfectly. They fit the karts perfectly too! Both of these karts are fitted with what we call the original "symmetrical" style because the loops stick out evenly on both sides. 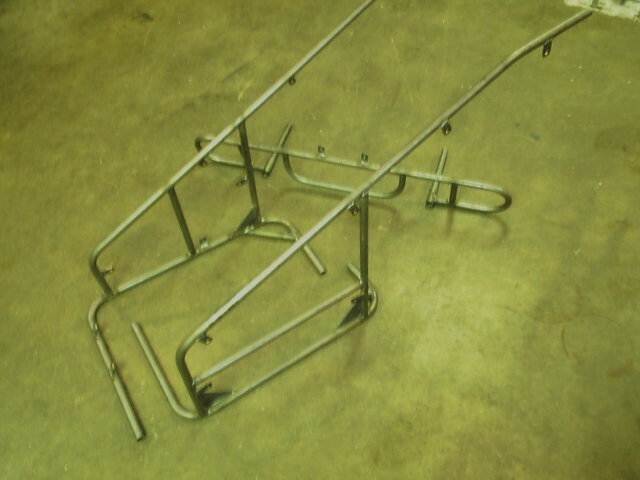 This is an offset bumper for Mongoose dirt oval chassis. We call this an original style asymmetrical bumper because the loops stick out more on one side than the other. It has the standard ends. We once had an order from a Jamaican customer who needed a bumper the could withstand continued hits from the rear. That is what inspired our Jamaican style center section. Since that time we have incorporated slip joind at the end of the center horizontal tube to allow the chassis to flex easier and not bind up. The West Coast Optional ends are available with either standard or Jamaican style middle sections. Please note; We do not provide chrome plating service. The customer arranged for the plating on his own. 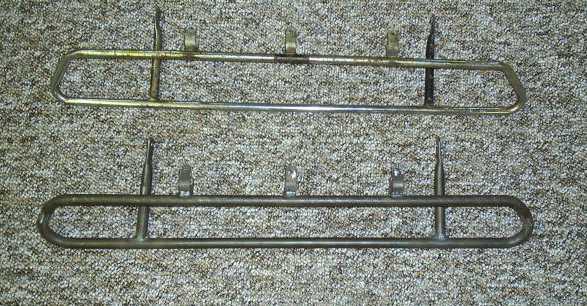 Need a bumper for one of those Margay or Trackmagic models that mounts at an angle to the top of the frame tubes. We make them all the time. The bumper shown has a Jamaican center but we make lots of them with the standard drop down center. New for 2010 is the UAS Wedge body style bumper. The bumper pictured features the West Coast double bend ends but it is also available with the standard single bend ends. 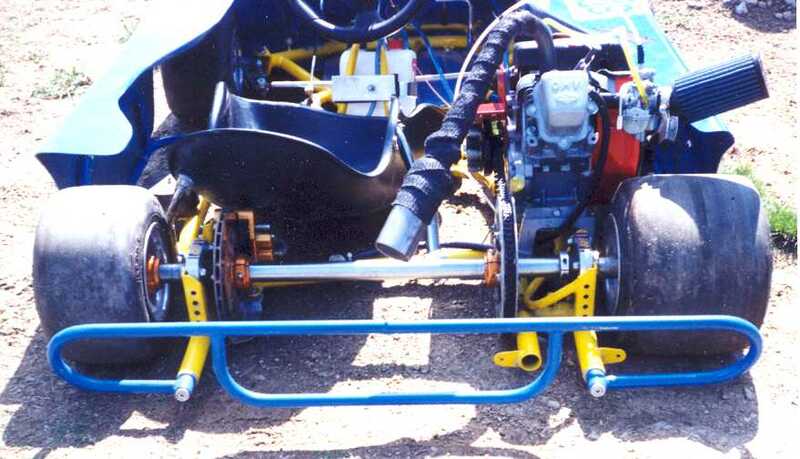 This bumper was designed to tie onto the sideboards of the wedge bodies of Unlimited All-Stars karts. Go to http://www.unlimitedallstars.org to learn more about this exciting division of karting. This bumper is designed to maximize the downforce created by the wedge body. It must be installed using our exclusive no-bind pins with extension bushings. New for 2015 is the addition of slip joints fro attacing the center section and at the lower right side vertical brace. These loints allow the chassis to flex freely, reduce stress fractures, and still provide maximum protection. The extended nobind pins and spacer allow positioning the bumper at the extreme rear of the body as required by UAS rules. To see this front bumper chrome plated and mounted on a pristine vintage kart click here. To see this rear bumper chrome plated and mounted on the kart click here. These pictures were taken at the 2005 Vintage Kart Nationals at Fremont, Ohio. At one time we had a special order for a reproduction of an aftermarket bumper that was produced for the Rupp Dart Kart and A-bone kart. The original was made from 5/8 tubing. Our first reproduction was made from 3/4 tubing but we now can produce them from 5/8" tubing. Producing this bumper required the fabrication of a set of patterns and jigs. We are offering these bumpers for $89 each, and $160 for a set of front and rear bumpers. They are considerally more work to make than the loop bumpers shown above. We do not provide chrome plating. The customers had that done on their own. We are willing to make reproductions of other vintage bumpers. Please contact us for details. Our integral exhaust pipe bracket. The bracket can be positioned along any horizontal tube on the bumper but must be installed when the bumper is being fabricated. We cand produce all sorts of nerf bars and bumpers. Contact us wity your requirements. 2. 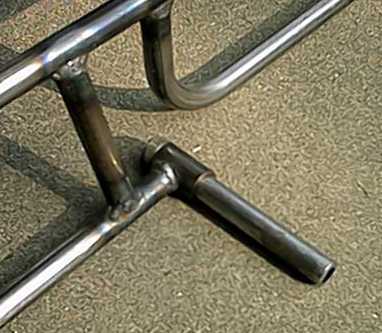 The second method requires that there are tubes attached to the bumper that insert into the ends of the frame rails. The frame rail and the bumper insert are cross drilled and a bolt is inserted through them to secure the bumper. 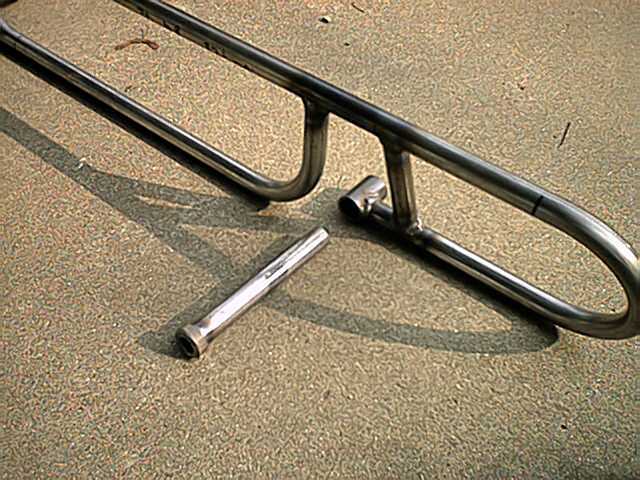 This method is often used in an attempt to keep the bumper from "binding up" the chassis or preventing it from flexing freely, but since the bolt is tight, and prevents twist, some binding of the chassis still exists. The bumpers that we make for this type of application utilize our unique no-bind technique pictured below.We recommend putting some grease on the pin where it fits through the bumper eye to insure that rust and corrosion will not form in the joint limiting flexibility. In cases where it is necessary to extend the bumper rearward we can make extended no-bind pins and spacers. Specify if for: 28mm / 1 1/8", 30mm / 1 3/16", 32mm / 1 1/4" outside diameter frame tubes. These are inserted between the adaptor plug and end plug so that the bumper bolt can be tightened but the bumper is still allowed to float. The bushing can be easily removed if it is desirable to have the bumper tighter to fine-tune handling. Call for current pricing of bumper hardware. Since we purchase these items and slightly modify them to fit our bumpers we have little control over the pricing. Are Bergfelt's Bumpers legal for my racing association? We are often asked if our bumpers are legal for WKA, IKF, as well as other associations. They are recommended by clubs all over the USA. Bergfelt's Bumpers pre-date those rules. When WKA first introduced full coverage bumpers for sprint karts in the junior enduro classes, our phone really started to ring. During the first season that Rotax Max implemented a full coverage bumper for their junior classes, ours were the bumpers that they recommended and the rule that they developed after that describes our standard bumper to a "t". Later on, the enduro kart racing club that races at Summit Point closely studied our bumpers when they were developing their full coverage bumper rule as well. It is our understanding that the final version of the WKA rule developed from what that club learned from our bumpers. Clubs all over the USA recommend our bumpers. We have made many, many for WKA, IKF, Rotax Max, Unlimited All-Stars, and other clubs and associations for sprint, enduro and speedway kart racing. Please note that in 2009 Rotax Max started requiring the use of the bulky plastic box type bumpers. It's too bad that they do not allow their racers the advantages of steel tube bumpers. Add .75 for each additional inch of overall length up to 53". Add the price of adaptor bushings for the no-bind pins....price varies with chassis tube size. Add $25 for adjustable-integral exhaust pipe mounting bracket.